Twilight rules in this forest. Alder trees, oak and chestnut filter the light falling from a clear blue sky. Ferns, shrubs, fallen branches, moss and grass absorb the little sunlight that finds its way through the foliage to the ground. This forest is rampant. The place seems to be teeming and bursting with trees without end – at least in my imagination. It stretches out endlessly, over the hills and beyond, mile after mile. I’m starting to lose myself in this forest, just as someone might get lost in the middle of an ocean or on a mountain slope. I disappear and will never return. Sublime infinity – in another context expressed by the Austrian philosopher Ludwig Wittgenstein – only exists by virtue of the thought of the opposite: the thought on the verge of a border. Just because man, according to Wittgenstein, can only think of the world as a ‘limited all’, the idea of boundlessness arises. Even this imaginary, unlimited forest has its borders. A narrow strip of asphalt winding from the unknown A to an even more unfamiliar B forms its border. The strip is a road: it cuts through the forest and tells: ‘So far, and no further. The road limits the unbridled forest, it restrains the forest, and on its skin of asphalt no seed will germinate. 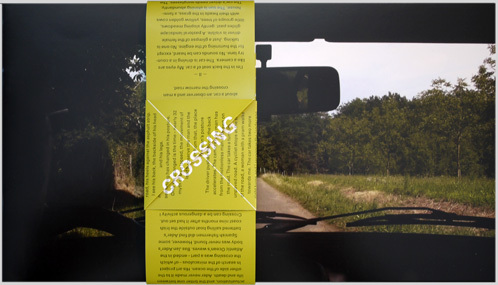 Visual artist Frans van Lent (1955) chose this forest and this road as the scenery of the 32 minutes film Crossing (2009) about a car, an observer and a man crossing the narrow road. I’m in the back seat of a car. My eyes are like a camera. The car is driving in a country lane. No sounds can be heard, except for the humming of the engine. No one is talking. Just a glimpse of the female driver is visible. A pastoral landscape glides past: gently sloping meadows, little groups of trees, yellow golden cows with their heads in the grass, a farmhouse. The sun is shining abundantly. The car’s driver needs sunglasses. The road winds into the forest. Suddenly darkness covers my eyes like a blanket. The driver brakes, gears down. Slowly my eyes adjust to the twilight. Tree trunks glide past; ferns are bobbing up and down. Then, in the verge on the left a shape looms up: a man is standing straight as an arrow on the side of the road. His face turned to the opposite side. The forest pushes in his back. The front of his shoes touch the asphalt. In John Boorman’s with three Oscars awarded thriller Deliverance (1972), four city friends go out to the wild in Georgia. What sets out as an adventurous trip ends in a horrifying cat and mouse game when two hillbillies hiding in the woods are stalking the four friends. Ever since Deliverance, it’s hard to think that meeting a man in the woods only results in just an innocent chat about the wonders of nature or the upcoming weather. On the contrary, you meet such a man cautiously, with suspicion. Likewise now: who is that strange man with his riding pants and t-shirt? Why is he standing there? Why does his face seem unmoved? Why does nothing in his posture reflect acknowledgement of the car? Why is he motionless? Is he a human being, a monolith, a Zen Buddhist, a demon of the forest? When on 9 July 1975 Dutch conceptual artist Bas Jan Ader (1942) sailed from Cape Cod (Mass. USA) for a transatlantic crossing in the tiniest of sailing boats, the artist crossed more than just one border. Ader not only crossed the border between land and water, but also the ephemeral border between dream and actualization, and the bitter one between life and death. Ader never made it to the other side of the ocean. His art project In search of the miraculous – of which the crossing was a part – ended in the Atlantic Ocean’s waves. Bas Jan Ader’s body was never found. However, some Spanish fishermen did find Ader’s battered sailing boat outside the Irish coast nine months after it had set out. Crossing can be a dangerous activity I was told as a child. At primary school I learned the drill: look left, look right and look left again before stepping off the pavement. However, more than only the risk of an accident lurks in the danger of crossing. As I got older, I experienced that crossing has more meanings to it, all associated with ambivalence, because of the suggestion of both threat and fear. Crossing is what politicians do when they leave their party for another (and we call such a person a dissident, someone who literally sits next to the seat he occupied previously). Crossing is what someone does who oversteps his bounds – by which nothing negative is meant. Crossing is when a man transgenders to be a woman, or the other way around, perceived as a vague and ambiguous identity by the uninformed. Crossing is mixing two breeds: plants, races, religions (with the devil between them). Crossing is stepping from one world into another, as did Orpheus when he went to search for his beloved Eurydice in Hades. Only very rarely, as we gather from the myth of Orpheus, does such crossing lead to a happy ending. The driver pushes the gas pedal and accelerates. The camera moves away from the motionless man at the side of the road. The car takes a turn, into an unpaved road. A cyclist stops at the side of the road, a woman with a pram walks towards me. The car takes two more right turns and I recognize the landscape again: I’m on the same road as in the beginning of the film. A few gentle bends, cows in the grasslands – I’m starting to recognize them, the darkness of the forest. Again that man – motionless, same posture as before. However, he has changed position and is now standing exactly on the verge of the road. The forest no longer pushes in his back. The car repeats the same route for five times. The car passes the man five times and each time the man has shifted a little further across the road. He is left of the middle, exactly in the middle, right of the middle and finally on the right side of the road, his heels against the asphalt strip. I see his back, the backside of his head and his legs. Nothing has changed in his posture. What has changed is the time – nearly 32 minutes have lapsed, the movement of the camera to observe the man and the man’s position. Apart from that, the place is the same and the man’s posture unchanged. Looking from the back seat of the car it seems like the man has moved across the road like a pawn on a chessboard. Why does someone want to cross? A simple explanation would be to get to the baker’s across the street. If you want fresh bread, you need to cross quickly and efficiently and place your order. According to the Greek philosopher Plato such an explanation would be too simple. Plato would have said: man crosses to achieve a higher goal. This is exactly what Bas Jan Ader did when he sailed from Cape Cod into the Atlantic Ocean. Ader’s goal was not to prove the physical challenge, but to search for the miraculous self. Crossing does not aim for that higher goal – which is what makes the viewer feel restless and uneasy. Five episodes, five drives later and it is still not clear what the man in the forest wants and why he manoeuvres so subtly across the road. There are several hints – the romantic forest, the metaphorical meaning of crossing, and the threatening man in the woods as a counterpart of the civilised human being – but these are only briefly touched upon. Aristotle, Plato’s great adversary in the philosophical spectre, would reject such higher notions. Aristotle would say: this man crosses the road because it is his nature; he cannot do otherwise. Just like moths have the inclination to fly into the light of the candle, or just like masculinity seeks to unite with femininity, this man has to cross. Almost seemingly with no will of his own. That certainly applies to Crossing. The way the man moves seems to be prompted by inner necessity, by an urge that may be as mysterious to the man himself as to the observer in the car. What is that inner necessity? What is this urge? No other philosopher than Albert Einstein has been of greater importance to twentieth century conceptual art and its discourse. From Marcel Duchamp to Jan Dibbets, from Stanley Brouwn to Frans van Lent – all have been influenced, either consciously or unconsciously, by Einstein’s relativity theory. In his theory Einstein explains that the meaning we give to an object, situation or human being, depends on the position we take ourselves. With that, everything becomes relative, but certainly not irrational. Crossing, too, is about relativity: of the position of the man on the road, of the way the camera records this position and of the swerving of the car to pass the man. These are the three main characters in Crossing, three positions. Around these positions, the world moves without change: the forest, the cows, the almost empty road, the farmhouses, the blue sky. Time passes, the man shifts positions and with that his place in the world and my way of looking at it. Please watch the work Crossing (2009) on top of this page. This text is part of the book Crossing (ISBN/EAN: 978-90-808675-2-9). For the realization of both the work and the book I would like to thank: Jello Reumer, Steef van Lent, Ton Kraayeveld, Bernd Trasberger, Paul Henning, Marie Claire Gellings, Antoinette Reuten, Loek van de Sande, Lucette ter Borg and the CBK Dordrecht.